I have had a number of questions from readers about household allergens and how to tackle them, preferably in a non-toxic way. Perfect timing as today (16 March) marks the start of National Spring Cleaning Week and what better time than to talk allergen busting vacuums! In this blog I will be looking at Miele, Dyson and iRobot. If you follow my blog regularly, you will know that I have never professed to being a domestic goddess. I married someone who had been passed on a “love” (read mild OCD) of cleaning, so that kind of got me off the hook. These days, the Fifi Friendly household has two kids and an 8 month old dog who like to create a little mess … every now and again/everyday. That will give you some idea of my situation, but now add in that I live in a newly converted house that manages to produce a crazy amount of dust, also that I live beside a farm, beside some fields, with a quagmire of a garden and then chuck in some delightful dust mite and pollen allergies. Now do you see why I have had to step up to the cleaning plate? More to the point, much to the old me’s distress, I am enjoying it. When both kids were pretty small, my mum gave me an iRobot Roomba. With a baby and a toddler in the house, it could not have come at a better time. 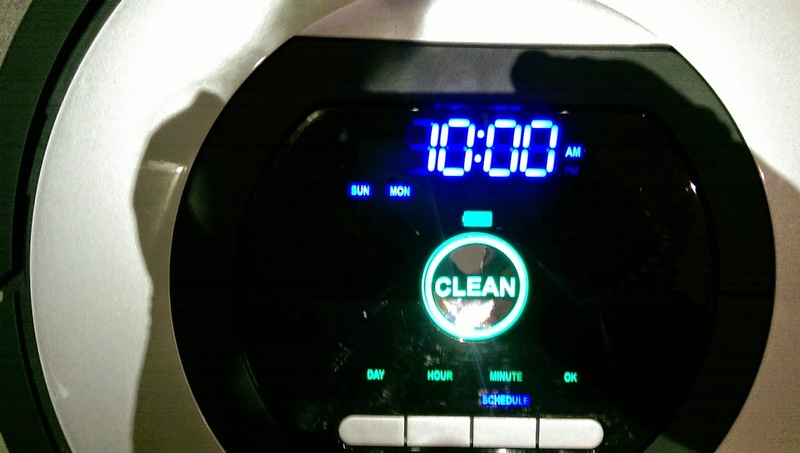 This machine is a godsend for busy families! I loved that you could charge it up and let it clean up crumbs or dust while you were out the house, or even just shut it away in a room to tidy up by itself. These days, I like to let it run wild around the bottom floor of my house, which is a mixture of tile and wood. Perfect. We got our new iRobot Roomba 775 this year and it is truly amazing. We are talking dual HEPA filters to catch household allergies, self charging, multi-surface cleaning, bagless, responsive navigation, edge cleaning bristles, a virtual wall to keep it confined to one area, a cleaning head that self – adjusts and then there is the soft touch bumper to stop it charging into your walls like a prop forward. The list of good things this little machine does is quite long. My favourite things about the iRobot can be highlighted in two areas. Firstly the fact that this clever little machine has 7 day scheduling. If I want it to start at 4am on a Tuesday, all I have to do is input it into the inbuilt scheduler. I have found this feature really helpful and will invariably leave it in a room to go off (as it were) when I am out dropping the kids off at school or am out walking the dog. Secondly, Sometimes you don’t want or need to get the big vacuum out. 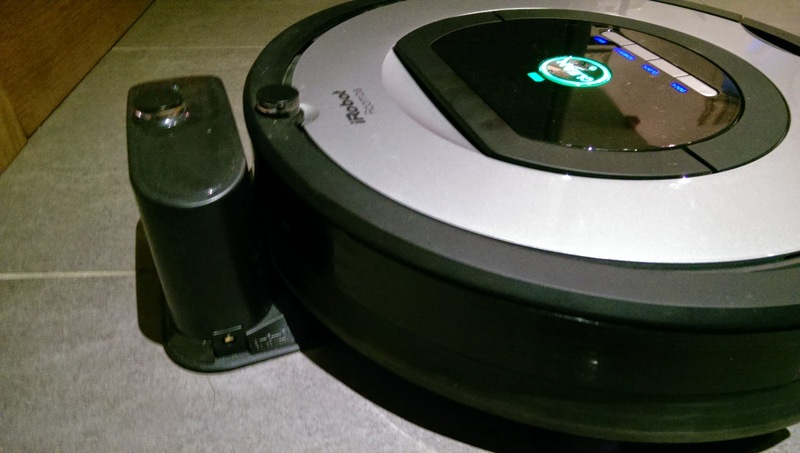 This rechargeable iRobot gives a touch up on cleaning and I love that. This is the lazy person’s best friend. This is the busy mum’s saviour as it gives her one less thing to do. This is one of the best things you could ever buy if you have a shedding dog or children that drop crumbs every mealtime. No, this is one of the best things you could buy for yourself, if you lead a hectic modern life. You set the Roomba off, it beeps when it is finished and all you have to do is empty it. Easy. It you want to make it more difficult, you can set the Roomba to talk to you in Dutch or one of 16 other languages it has on board… just for a bit of fun! The handy iRobot Roomba also shouts to let you know when it is full or when it needs charged. iRobot have a big range of Roombas and also have other products like the floor scrubbing Scooba, floor mopping Brava and their gutting cleaning Looj. They make great products to free your time up to do something more fun/interesting. A couple of things I have not mentioned are the battery life and pet hair. This Roomba can cover a couple of rooms effectively on one charge. It is also great at picking up my molting Labrador’s hairs. This is probably also a good time to mention that dogs are notorious for not being fans of vacuums, but our dog is not bothered by the Roomba cleaning around him! If you only want to do a small area there is the spot clean function you can press. If you can’t be bothered bending down to turn it on, there is also a remote control. It just keeps getting better! Finally, when the Roomba has finished it’s chores, it returns to the home base to charge. Perfect! Our Roomba has become such an integral part of my household, I feel like we should actually have named it! In the week between get the new Roomba and the old one dying, I really noticed a difference in the amount of cleaning I had to do. I can’t imagine being without it now. Next up is Dyson. About 12 years ago, I got my first Dyson, the DC04, from that point on I sang it’s praises. To me it was fairly perfect. It vacuumed well …great start.. and it tackled dog hair well … which was great for when my parent’s pets come to stay. I remember speaking to a cleaner friend who did not use a Dyson and I could not understand why. Sadly, the thing I loved most about the Dyson was, and still is, inspecting to see how much dust and debris I have sucked up in the clear bin. Did any of you ever use those deep cleansing nose pore strips? You know the ones that peel off blackheads. I shared a flat with someone who loved inspecting the strip afterwards to see the end result. For me Dyson is similar, there is a sense of pride in filling that bin full of dust and debris! My old Dyson was beginning to lag a bit and without much consideration to other brands I started to research another Dyson. 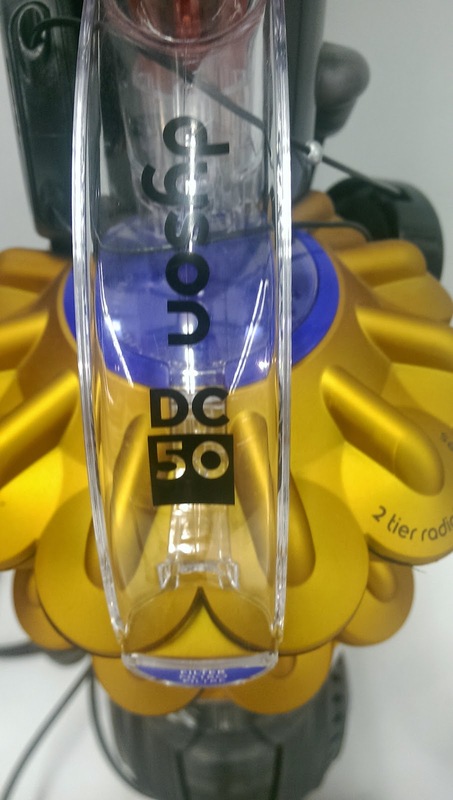 We decided on the DC50. I liked that this Dyson was lightweight and had upgraded innovative technology. I was actually a little excited before it came and when it arrived it looked great. The statistics of this Dyson sounded good but I found myself being a little disappointed after trying it a few times. The cord was not long enough. I found myself having to plug it in to the room I was vacuuming, then unplugging to take to the next room. The attachments on this Dyson did not fall off easily, like they did on the DC04, but I did find that the stretch hose didn’t stretch far enough for me. I also found that the hose and the Dyson in general felt a bit flimsy, almost like the plastic would break easily. What I did find impressive was the suction power, it truly was an improvement to the old machine. We have a dirt trapper rug beside the garden door and the Dyson went to town on it. The self adjusting head is a great feature and the Dyson did move seamlessly between rugs and hard wood floor. One of the main differences between my old and new Dyson was the ball technology. 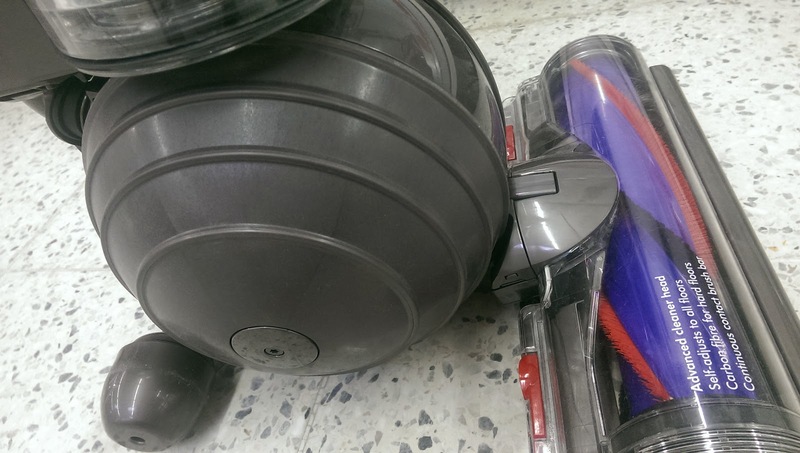 Essentially the vacuum sits on top of a ball which is meant to make it easier to move about. This took me a bit of getting used to and I did find it more difficult to manoeuvre. To be fair this could also have been because of the powerful dual cyclone suction rather than the ball! The thing I found most frustrating, was that although this vacuum has the British Allergy Foundation Seal of Approval and it also has a more hygienic bin emptying than my old DC04, I found it actually heard to empty. It was never as simple as pressing the button over my bin and emptying. Invariably some debris would stick inside the bin and before you knew it there was dust flying up everywhere. Sadly, we decided to return this vacuum to Dyson. I have recently tried a Dyson DC25 to see if I got on better with this, but found the same bin emptying system an issue. More dust ended up over me and the surrounding area, than ended up in the bin. This was only annoying as it seemed to make me sneeze. I like the idea of the easy emptying bin, but I found that clumps of dust got stuck and were not always easy to dislodge. 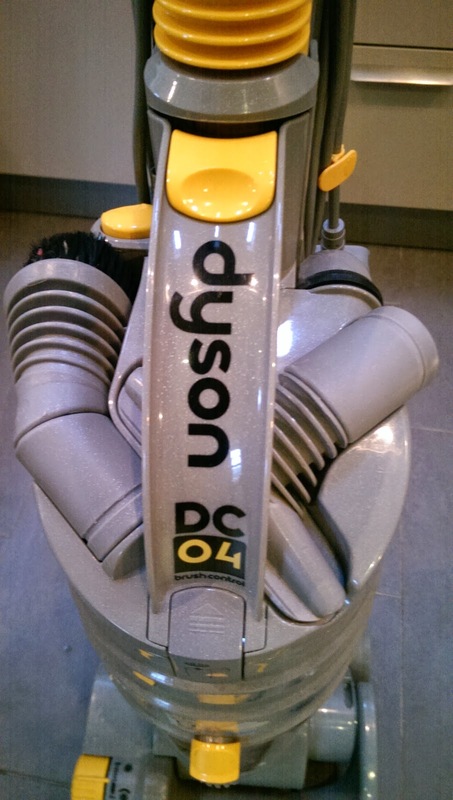 I have loved my DC04 and wanted to love the new Dysons I tried, but it might be that I have not yet found the Dyson to suit my house. I will keep on looking. The last vacuum, I will be looking at in this blog is the Miele C3 or if we are going by it’s full name the Miele Complete C3 Total Solutions Allergy Powerline Vacuum Cleaner! 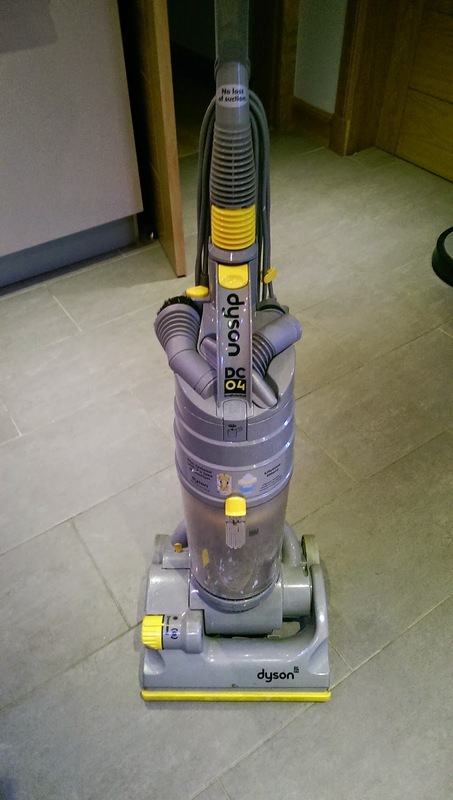 Since I started to use this vacuum I have found myself wanting to clean more frequently…. I have shocked myself! I have lent it friends to try, I squawked about it to my best friend, I have just come off the phone to my brother’s PA telling her how amazing it is and I have found myself talking about it to nearly everyone I have come into contact with. Not wanting to sound to dramatic here, but this Miele has changed me. Then there is what it has done to my house. This vacuum cleaner extraordinaire has been designed with allergy sufferers in mind. If dust or pet hair are an issue for you, then this is vacuum for you. This vacuum is so much more than allergy busting though. Firstly there is power. This energy efficient appliance is very powerful. Depending on the surface you are cleaning there is a number of different tools to attach. For carpets there is the Turbo brush, for hardwood floors there is the … Hardwood Floor Twister and for extra suction between different floor types there is the super efficient AirTeq Floorhead, which replicates 2000w performances whilst only using 1200w. The Miele C3 is well made, feels robust, well balanced and is really light. The +/- buttons on the vacuum allow you to adjust the power settings really easily. This is one of the functions I like the most. They really have thought of the consumer when designing this vacuum. Everything is there to make your job easier. I love that the small attachments are hidden away safely in an integrated compartment. I can’t be the only person who has lost vacuum attachments before? You press a button and you get access to the upholstery nozzle, dusting brush and crevice nozzle. The telescopic tube of the C3 is easily adjustable. You can alter depending on your height or if you are cleaning cobwebs that are high up on the ceiling for example. When fully extended I found it much easier to clean under the sofa without actually moving the sofa. This vacuum has a HEPA 13 filter which helps tackle 99.999% of dust and pollen from the air. This added to the HyClean GN dust bag that is used in this vacuum makes this fairly awesome. These dust bags are self-closing so when you remove them there will not be any dust escaping. Result…. no sneezing. I don’t see the point in spending time vacuuming just to allow some dust back out when you empty. These dust bags also have a clever 3D design which disperses the debris evenly, allowing it to hold more. At the end of the day we are unlikely to get a product to clean up 100% of allergens but the C3 does a pretty perfect job. The dust bags have an energy rating “A” and the vacuum has an 11 stage filtration system, meaning that the air that is discharged back out is actually cleaner. I have found my Miele C3 to be really compact. Even the long length cord – Comfort Cable – is tucked away inside and can be retracted in at the press of a button. Great feature as there is nothing more annoying than navigating around excess cable. The long length cable also meant I was having to unplug the vacuum only once whilst tackling my whole ground floor! There is so much to say about this vacuum and I have not even touched on the noise level. This has to be the quietest vacuum I have ever come across. I can easily hold a conversation with my kids when cleaning with it. My daughter has fairly sensitive ears and when I use the Miele she does not cover them up like she did with our Dyson. I am sure I have missed something out, but it is fair to say that I am in love with my Miele…. just in case you had not guessed. It has change my perception of vacuuming in so many ways. What is your favourite vacuum? Do you suffer from allergies? My favourite vacuum cleaner is also my Miele. I have a C2 MedicAirPlus. If my Miele dies on me I will probably get another one. I also used a KirbyG5, that I have sold and Sebo is my other favourite. One can have more than one favourites.😀. Water filtration will also be good for me due I dislike to clean out a bagless. Personal preference.